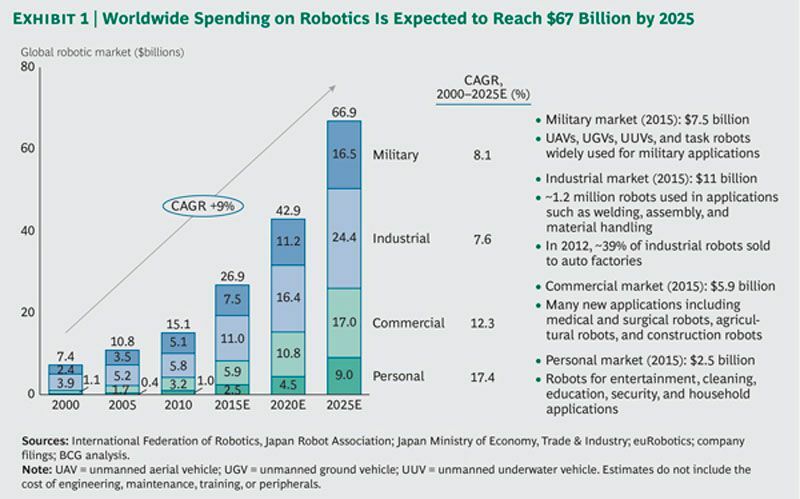 Boston Consulting Group (BSG) recently released a global robotics market study that projects industry growth of 10.4% CAGR (Compounded Annual Growth Rate). The personal segment—robots used for entertainment, cleaning, education, security, and household applications—is projected to grow the fastest, at a compound annual rate of 15.8 percent, ballooning from $1 billion in 2010 to $9.0 billion in 2025. The commercial segment—robots used for medical and surgical purposes, agriculture, and construction, among other applications—is expected to grow at a compound growth rate of 11.8 percent from $3.2 billion to $17.0 billion, overtaking spending on military applications. The industrial segment—robots used in applications such as welding, assembly, painting, and material handling—will continue to be the largest, growing at a compound growth rate of 10.1 percent from $5.8 billion to $24.4 billion. The military segment—for unmanned aerial, ground, military exoskeletons, and underwater vehicles, among other applications—is projected to grow at a compound growth rate of 8.1 percent to 2025 and will be second largest, at $16.5 billion. Driving this growth is a convergence of falling prices and performance improvements. The cost of high-quality robots and components is dropping rapidly, while CPUs are getting faster, sensors are getting smaller and less costly, and application programming is getting easier. As robots become cheaper, smaller, and more energy efficient, they gain flexibility and increase the range of potential applications.